I remember when I did a stint teaching English as second language to Korean kids, one of my students talked about Korean food and her favorite, Kalbi (or Galbi) meat (while I shared with her about lechon ;)). 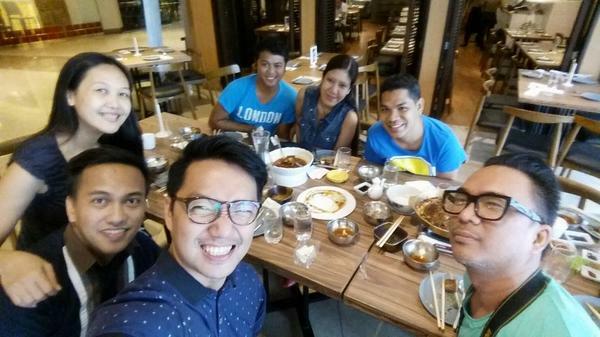 At the time, there were only a few Korean restaurants in Manila (and a few blogs that write about food! ), and if you were not with a Korean friend, you would not know what and how to order in a Korean Restaurant. It would be a bit intimidating. In the 6th Level of East Wing Shangri-la Plaza, there is a modern family Korean restaurant that offers traditional Korean food that retain its authentic flavor - Woo Galbi. The name refers to a specialty consists of marinated beef short ribs. But Woo Galbi is not all about galbi (or kalbi), ribs and meat, keep on reading to find out what's on the appetizing menu. Click Read More to see more of Woo Galbi's appetizing offerings..
crunchy wonton crisps and apple slices on the side. Pan fried tofu with special sauce. These are thin slices of meat wrapped in soft tortilla flour. I love the generous serving of greens, and the special sauce. For those who love Ramyeon and Noodles, Woo Galbi has a good mix of spicy, flavorful and hearty ramyeon. This is another favorite. I love the mix of avocado and mangoes! I cannot find this in the menu, but this is highly recommended. A new sushi experience for the classic California Roll. I love the mix of sweet and sour sauce. Now let's go to real meal. Although the appetizers are already filling, I feel that I didn't truly eat a meal (or lunch or dinner) if I have not had rice. In Woo Galbi, they make Bibimbap a little more fun and exciting to eat. You can choose your own dish, rice, topping and sauce for only Php 420! I love the tender meat strips and the sauce! It seems that the meat platter was not enough for us. I was ready to order another Ssam plate, when this was served to us! We skipped desserts because we were so full. Woo Galbi serves cheesecake, ice cream and chocolate cake. It also offers Yogurt Ice Cream Bars. Check out Woo Galbi for some good, authentic Korean dishes. You would also love the modern, posh ambiance. If you dine outside the main hall, you get a good view of the Shangri-la driveway (not so romantic scene as that of Gramercy's), but what is a good view without a good company? PS. Check out this promo from Woo Galbi. 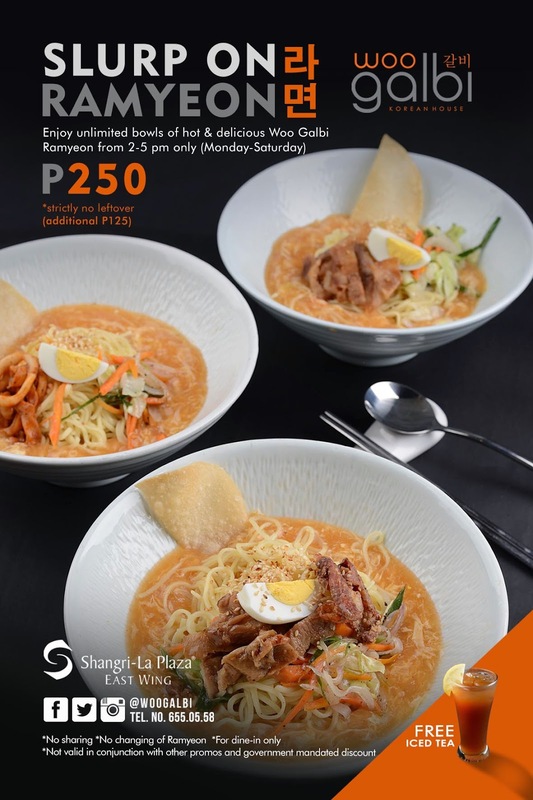 Enjoy unlimited Woo Galbi Ramyeon from 2 to 5 PM (Monday to Saturday) for only Php 250! Slurp away! Have you tried Woo Galbi? How's your Woo Galbi experience?